Astute readers will recognize David Dart’s name from way back in issue 11. Among Dart’s bowlback lap steel customers is that issue’s cover story, Ben Harper. 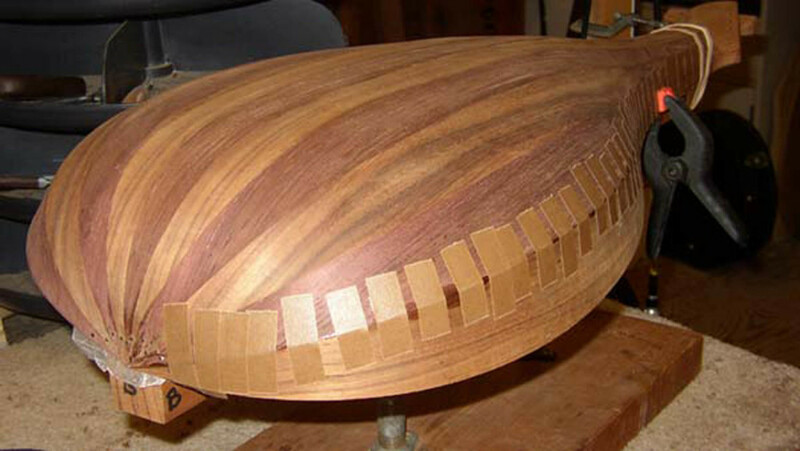 In addition to his unique bowlback designs, Dart builds more traditional Hawaiian guitars, mandolins and mandolas, and both archtop and flattop guitars. He also tries his hand at the occasional harp guitar, oud and lute. He’s even built a saz (a long-necked lute-like instrument, also known as a bağlama) for David Lindley. To see all these instruments and more, you might want to check out the Gallery page on David’s website. Naturally, Dart’s resume makes him a prime candidate for our Bench Press treatment, so we reached out to hear a bit more about he’s working on and the background behind those trademark bowlback designs. 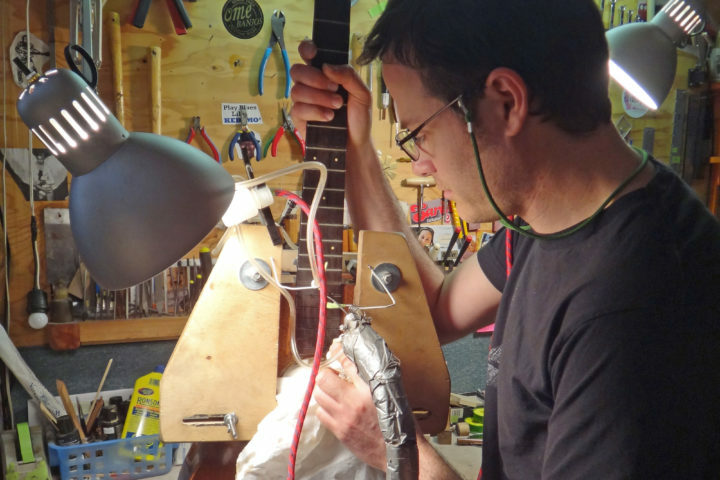 David Dart: I’ve just strung up a new guitar and there are still a few things to do to dial it in. It is a twelve-fret-to-the-body dreadnaught, the slope-shouldered design with a slightly longer body. It has a slotted head, abalone around the top and fretboard end, and boxwood binding. The back and sides are cocobolo – some really straight, vertical grain stuff. The neck is mahogany, with a Sitka spruce top, ebony fingerboard and bridge. 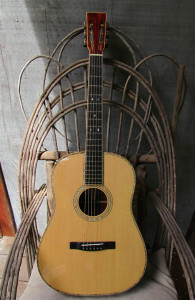 This guitar, as with all my guitars, has a Spanish-style neck/body joint – the neck and block are all one, with the sides slotted into the block. This guitar has amazing sustain! I’m also in the middle of a major restoration of an old Washburn: many cracks in the top to fill with slivers of spruce, patches on the inside, etc. It needs a new bridge plate and bridge, neck reset; there’s enough to do on the inside that I took the back off. This is the first older Lyon & Healy guitar I’ve seen that had its top put on after the neck was glued to the sides – there’s no dovetail cut through the top, which made neck removal a real pain! The guitar is in many pieces at this time. FJ: Where is your shop located? DD: I’m located in Mendocino County, California, about 14 1/2 miles from the coast in the little town of Navarro (pop. 67, elevation 272). My mailing address is Philo, since the highway mail comes out of Philo, but I’m within sight of the Navarro sign at on Highway 128. DD: Yes, it is a small town – only a general store and P.O. Boxes. FJ: How did you get started building guitars? DD: I’ve made and repaired instruments since I was a teenager. 50-plus years now! My first instrument, an Appalachian dulcimer, is dated 1964, when I was 16. I’ve been a custom maker ever since and have made close to 50 different styles of instruments. This last guitar is number 223 and is the first of that style. Meaning different plans, different molds and forms, etc. I’ve never specialized, I guess because I like them all! I’m still thinking of instruments I haven’t made but want to. I’ve been a repairman the whole time too, which slows down the making but brings people into the shop. FJ: Building so many different kinds of instruments, do they influence each other? DD: I think that being a repairman as well as a maker has helped me to see where instruments tend to fail and therefore be able to build mine so they don’t. Building a wide variety lets me see how the construction and dimensions affect the sound in a variety of ways. As a custom maker this is very important in designing an instrument that meets the expectations of the customer, especially if it’s a hybrid that combines various aspects of several instruments. I tend to be traditional in my designs, but I draw my own shapes and use my own feeling of bracing and structure when I design. DD: I built several of my bowlback lap steels for Ben Harper; he also has the Theorbo Steel, which is seriously cool! It is 10-stringed, with six regular strings and four longer scale drone strings. 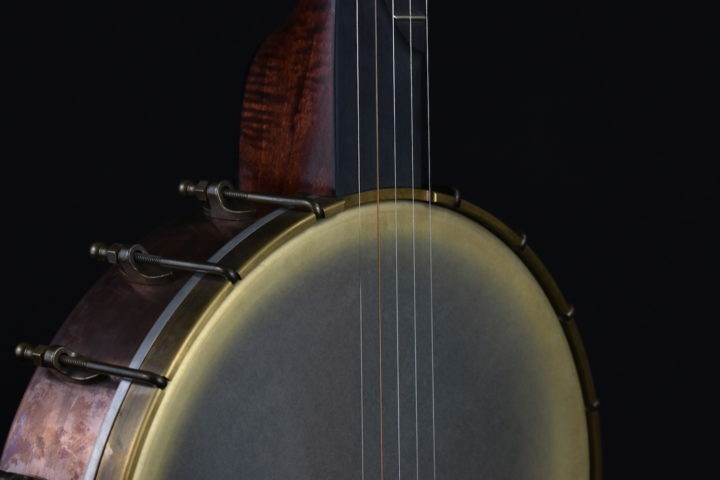 It has the same bowlback body as the six-string, but the head has an extension that holds four more strings at a longer string length. These four strings can be played with the steel or allowed to sound sympathetically, and I made little saddles so those strings would buzz nicely. I didn’t have an order for it, just seemed a cool thing to make. There is a clip of Ben playing it on my website – www.luthier.com – yes, I got that URL a while back! I was actually thinking of Ry Cooder when I made it, but Ben saw it first and bought it immediately. I guess I should make some more! FJ: Can you elaborate a bit on the bowlback design? Is there something particularly your own in there? DD: The bowlback lap steel is one I designed for Ben Harper. He has a lot of Weissenborns and other Hawaiian guitars and wanted something that sounded different. He knew I make lutes (I’ve known Ben and his wider family since I was ten years old; I learned guitar from his grandma) and wondered what a lute-backed steel would be like. 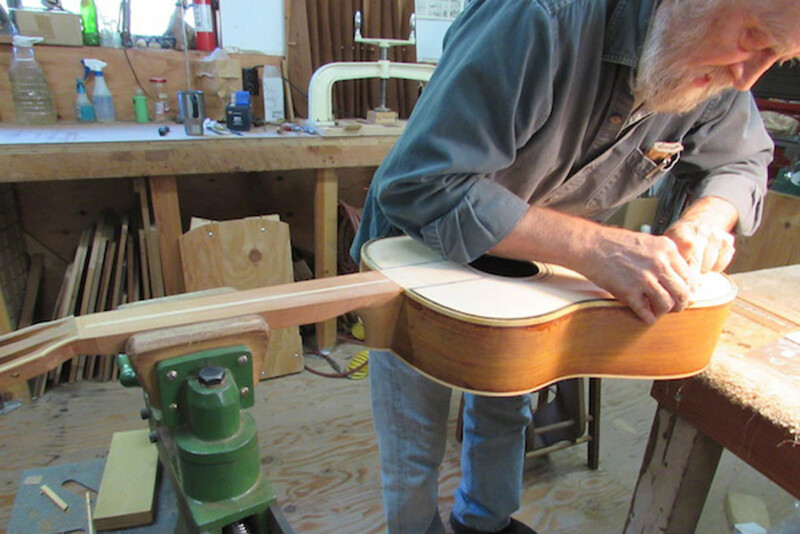 We discussed various designs and options and decided to go with the lute back and a hollow neck – a big teardrop of eleven ribs, which had to be mostly flat across the back so it wouldn’t roll off the lap. It is approximately a half circle at the midpoint and deeper than wide at the head. The ribs have to bend two different ways and twist as well. It’s a very weird body to make but the sound is amazing. It has a focused, round sound that fills the room. The top shape allows for a really long X-brace pattern, giving a very deep full bass and a round, penetrating treble response. I have kept one bowlback, so far. It is the only one that is all-mahogany. It has a woman’s head carved at the top, with checkered binding going on up to be ribbons in her hair. There are pictures on my website but you have to see and play it to get the full effect. DD: I have only one order a this time. It is for an eight-string Weissenborn-style lap steel. I’ve made quite a few standard six-string models, but this will appeal to the real steel players. It goes to Ed Littlefield of the Marley’s Ghost. 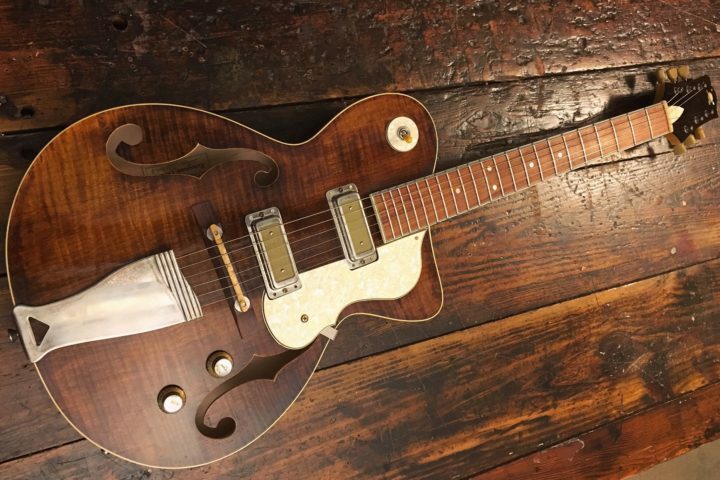 DD: I have a number of instruments lined up in my head that I want to make: Several A-style mandolins started, wood set aside for an archtop guitar, more bowlbacks… so many instruments, so little time.